Another day, another move by the Twins: On Wednesday they traded outfielder and former first-round pick Aaron Hicks to the Yankees for catcher John Ryan Murphy. I like this trade for both teams, and for both players. 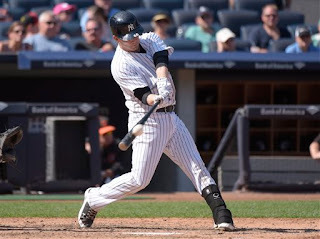 The Twins are spilling over with outfielders and lacked catching depth; the Yankees have an established (and highly paid) veteran catcher as a starter and a promising prospect pushing for the backup job, while their outfield core is aging and brittle. Yankees-Twins trade: Hicks has more upside than Murphy, but Murphy is at harder position to find. A trade that makes sense. Cooper, the managing editor of Baseball America, goes into a bit more detail on Murphy here. I thought that Hicks was destined in Minnesota for a fourth-outfielder role, with Byron Buxton, Eddie Rosario and Max Kepler all higher-ceiling guys than him. I don't have to buy into the Miguel Sano as an outfielder notion to see little room for Hicks in the Minnesota outfield. I also think Yankee Stadium might help mask Hicks' flaws as a left-handed hitter by turning a handful of flyballs into homers. And, to be blunt, the Twins really needed somebody who can be an alternative to Kurt Suzuki, who did not have a good 2015 and who is, as a catcher above the age of 30, has the arrow pointing down. Murphy isn't a budding star, but he might be a four-or-five year regular at a difficult position to fill. With Brian McCann ahead of him, he wasn't going to get that chance in New York. The Twins on Tuesday traded backup catcher Chris Herrmann to Arizona for minor-league outfielder-first baseman Daniel Palka. Palka, a left-handed hitter, has hit 60 homers in the lower levels of the minors, including 29 last year for Visalia in the High-A California League. Power is an important tool, and he has it, but at 24 he's a bit old to be in A ball. Presumably he'll be at Double-A Chattanooga in 2016 to fill the Adam Brett Walker role of a right fielder who either hits home runs or whiffs. More significant than the addition of a low-level outfield prospect is probably the deletion of Herrmann, who has spent parts of the past four seasons with the Twins but never got much playing time -- 389 plate appearances all told -- and didn't hit in what time he did get (.181 batting average). Herrmann was the primary backup to Kurt Suzuki last year, and now he's gone. The other catcher who spent some time with the Twins, Eric Fryer, took free agency after being outrighted last month. I still suspect that if Herrmann were given regular at-bats in a platoon role he would hit a bit, but the Twins never saw fit to give him that chance. The Diamondbacks ran six guys behind the plate last season, and maybe Herrmann will get a shot there. Meanwhile, the Twins have no obvious backup to Suzuki, much less somebody capable of pushing him for playing time. Josmil Pinto is the only other catcher on the 40-man roster. He missed much of 2015 with concussions and isn't a good receiver anyway, so the Twins can't count on him. Presumably there will be a more reliable option on hand when training camp opens, either via free agency (A.J. 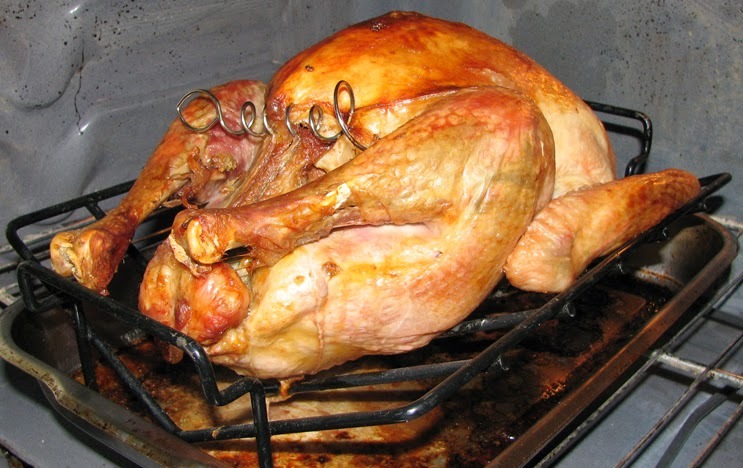 Pierzynski, perhaps) or by trade. Baseball Amercia's analysis of the trade is here. I didn't see this coming, but few if any outside the closed-mouth Twins organization did: The Twins on Monday landed the negotiation rights to Korean slugger Byung-ho Park. In a nutshell: Park's Korean team, the Nexen Heroes, posted the 29-year-old first baseman. The Twins bid nearly $13 million for the right to sign Park. If they do sign him by the Dec. 8 deadline, the Twins owe the Heroes the $12.85 million; if they don't, they owe the Heroes nothing and Park plays in Korea next year. It's rare, but not unprecedented, for a posting rights winner to fail to sign the player in question, so I expect the Twins and Park to strike a deal. Then what? Park racked up big power numbers in the Korean league, bopping more than 50 homers each of the past two seasons. While there is no reason to expect him to hit 50 in the states, his Korean production was similar to that of Jung Ho Kang, who had a fine rookie season for Pittsburgh before suffering an injury on a take-out slide. Jung Ho Kang, 2014: .356 AVG, .459 OBP, .739 SLG Byung-ho Park, 2015: .343 AVG, .436 OBP, .714 SLG Kang hit .287/.355/.461 as MLB rookie. Park has flaws. He's limited to first base defensively, and he has, like Miguel Sano, a tendency to swing-and-miss. Inside fastballs are specifically said to be an issue for him. But if he hits as Kang did last year, there's certainly room for him in the Twins lineup. But where? His likely addition opens a new window on the Sano-to-the-outfield chatter of last week. Pencil Park and Joe Mauer in to share DH and first base duties. If Trevor Plouffe remains at third base, the outfield is the only option to keep Sano in the lineup. Which is, really, rather backwards thinking. Sano has to be in the lineup, and you work around that reality. 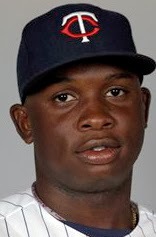 Can Sano play outfield? He hasn't in games, Even if he's passable in left or right, there's no way he's going to be as adept as Eddie Rosario or Aaron Hicks. Which, as I see it, makes a trade of Plouffe likely. I'd rather have Sano at third than in the outfield, and it seems silly to stall Byron Buxton's emergence for anybody. 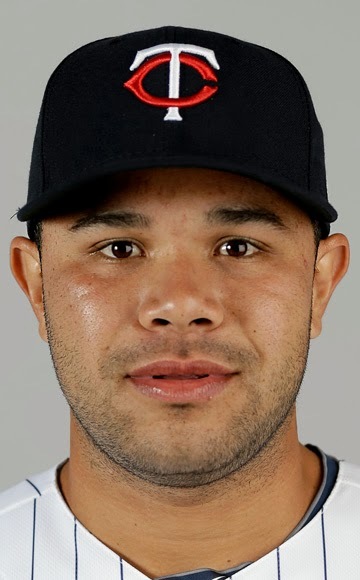 I'm hoping that the Sano-as-an-outfielder notion is a smokescreen designed to bolster Plouffe's trade value by presenting the illusion that the Twins aren't trading him to make room for Park. There are, I suspect, two types of sophisticated defensive metrics: the publicly available ones, and the proprietary ones designed by individual teams' analytics departments. In his essay accompanying the shift stats in the 2016 Handbook, John Dewan says that major league teams shifted 13,298 times in 2014 and 17,733 times in 2015. (Those numbers represent balls put in play when the defense is in a shift, so at-bats in which the defense is in a shift early and out of it later aren't counted, and neither shifts in which the batter strikes out, walks, etc.) That's a 33 percent increase last year. The shifts, by BIS' calculations, prevented 266 runs over all. That's a 36 percent increase over 2014's 196, and suggests that teams are becoming more efficient at shifting. One other general point: BIS believes that the optimal number of shifts is more than double last year's total, that the upper limit is probably around 40,000 shifts. MLB isn't there yet, but if shifting continues to increase, 40,000 is possible in a few years. In 2014 -- with Ron Gardenhire as manager and Paul Molitor assigned to handle shifts (an assignment widely viewed as being an override of Gardenhire's preferences) -- the Twins deployed 478 shifts. Only three teams in the American League used fewer shifts. In 2015 -- with Molitor now the manager -- the Twins used 724 shifts, sixth most in the AL. That's an increase of 246, That's a 34 percent increase. The Handbook does not provide a team-by-team breakdown of runs saved by shifts, so I don't have a precise number for the Twins. Across the majors, teams saved 1.5 runs per 100 shifts, so if the Twins shifted at average efficiency they saved roughly 10 runs with the shifts. Ten runs sabermetrically equates to a win, so that's hardly an insignificant matter. Wednesday's World Series parade ended. I guess the fans in Kansas City were a little excited about the Royals' World Series win. 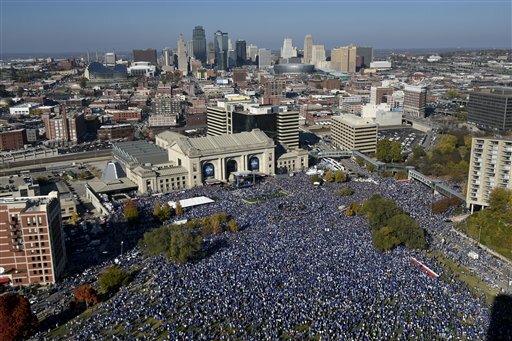 The city of Kansas City, Missouri, says 800,000 people came to the victory parade last week. That's more people than live in the city. The Kansas City Star had this piece about the logistics and expense of the celebration. The word from Terry Ryan this week was that Miguel Sano is to play some winter ball this offseason, which he was prohibited from doing a year ago as he recovered from Tommy John surgery. That's good. The bad news, or at least potentially bad, is that he's to play some outfield. This is silliness. Nothing good is going to come of putting a 260-pounder in the outfield. Sano may indeed "run well for his size," but that means merely that he's more mobile than a block of granite. Sano is not faster than Eddie Rosario or Aaron Hicks. He has no chance of covering the ground in a corner outfield spot than they do. And -- again -- it's not like they have to do something to get Sano's bat in the lineup. The Twins play in the American League. They have the DH. If the issue is about keeping him in shape and working on his defensive skills, they can rotate him at the corner infield spots with Trevor Plouffe and Joe Mauer. Putting Sano in the outfield means (a) one of the young outfielders doesn't play and (b) means a weaker hitter is in the lineup to DH. It makes the lineup worse in multiple ways. And this fallacy, as it so often does, boils down to: He's too young to DH. Which is, again, silliness. He's too good a hitter to leave out of the lineup, and he's not good enough with the glove to help afield. Those are what matters, not his age. If we're all fortunate, this notion will dry up before spring training ends, if not before. Thursday's post focused on Phil Hughes' ever-changing repertoire and mentioned Neil Allen pushing for more changeups from the Twins pitchers. *Nolasco and Pelfrey don't throw a "changeup" as defined by BIS. They use a splitter instead, and these numbers are for their splitters. Pelfrey's second number is from 2013, since he barely pitched in 2014. What can we take from this? Pretty clearly there was a greater emphasis with Neil Allen/Paul Molitor on changing speeds than there had been under Rick Anderson/Ron Gardenhire. Milone barely changed, but he was already throwing his changeup almost a quarter of his pitches. Nolasco dropped off pretty sharply throwing his splitter, and I suspect his forearm/elbow issues had something to do with that. Gibson was obviously a major change, from 13 percent changeups to 20 percent, and it appears to have been a significant pitch for him. BIS says he had the fifth best opposition OPS off his changeup in the American League (.545, rankings based on at least 100 batters faced). The annual Bill James Handbook showed up in my mailbox this week, and I figured I'd spend a few days cherry-picking information. One of the first pieces of data I looked up was Phil Hughes' pitch choices. Hughes has been ... inconsistent, let us say, from year to year about what he throws and how often he throws it. Oh, he has always thrown the fastball more than 60 percent of the time, but the secondary pitches vary so much from season to season. 2012: 65 percent fastballs, 18 percent curves, 10 percent changeups, 4 percent sliders, 2 percent cutters. (That comes out to 99 percent, so presumably there are rounding errors involved). 2013: 62 percent fastballs, 24 percent sliders, 9 percent curves, 5 percent changeups, less than one percent splitters. 2014: 65 percent fastballs, 21 percent cutters, 14 percent curves, less than 1 percent changeups. 59 percent fastballs, 20 percent cutters, 16 percent curves, 5 percent changeups. The only significant change is about five fastballs per game became changeups instead. Neil Allen, who debuted this year as the Twins pitching coach, came in preaching heavier use of the change-up. While I agree in principle, I thought that it was a mistake in Hughes' specific case; he had ditched the changeup almost completely in 2014 and had the best season of his career. With Hughes, they were fixing something that wasn't broken. A few days ago, the Washington Nationals had settled on Bud Black as their manager. On Tuesday, they officially announced the hiring of Dusty Baker. In between came an apparently contentious contract negotiation with Black, who found both the length of contract and salary too small. The Nats have gotten a reputation for low-balling managers, and that is apparently by design, Their initial offer to Black was a one-year contract; meanwhile, Don Mattingly got four years from the Miami Marlins, and the Fish have made a habit of paying people not to manage them. The Black fiasco should be an embarrassment for the Nationals, but I suspect Baker's actually a better choice for Washington. For all his sabermetric and tactical shortcomings, Baker's well-established as a handler of egos, and that might be the biggest specific task for the manager of that squad. And while he was justly criticized for his mishandling of a talented set of young pitchers during his tenure with the Cubs, Baker appears to have learned from that experience. He was the manager of the Cincinnati Reds when Johnny Cueto emerged as a star. In 2012 the Reds led the National League in run prevention; in 2013 they were fourth, this in an extreme hitter's park. in those two years, nine Reds made at least 30 starts. That's not a record that fits his reputation as a pitcher-killer, but that reputation ought to be outdated by now. The Nationals had high expectations entered 2015, and failed to come close. There will be a good bit of roster churn there this winter, but they will still have Bryce Harper and Max Scherzer, and they will continue to have high expectations, perhaps higher than they ought to be. Assuming that Gardenhire doesn't need the job financially, I would think it's a question of: What's the best route for gaining the managerial job he really wants? My guess is that he (and his agent) will figure that he's better off remaining a free agent and waiting for somebody to get canned in midseason. To be specific, there was a widespread expectation that Detroit would fire Brad Ausmus after their disappointing 2015, and that Gardenhire was his most likely successor. Ausmus has been retained for 2016, but the leash is probably short. There's a genuine logic to Gardenhire deciding to decline any coaching jobs to keep himself available for a managerial post. in North Mankato as part of the annual sculpture walk. One of the 31 pieces in this year's CityArt Walking Sculpture Tour in the downtowns of Mankato and North Mankato was this baseball themed one. 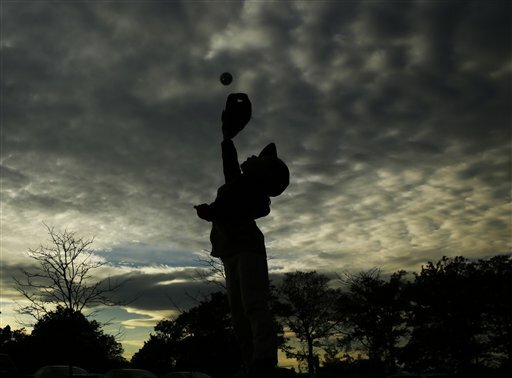 "For the Love of the Game." I finally got around this weekend to taking some photos of it. It would easily have gotten my vote for the People's Choice award, but it wasn't eligible, I assume because the artist, Bobbie Carlyle of Colorado, put a $66,000 price tag on it and wasn't willing to commit to the winner's price of $10,000. These pumpkins greeted our trick-or-treaters Saturday night. The middle one was her complex one -- Minnie from the original Twins logo throwing a pitch. Linda wasn't completely pleased with it, but I am an admirer of it. celebrating the last out of the World Series. And so the season ends, with a truly deserving World Series champion. 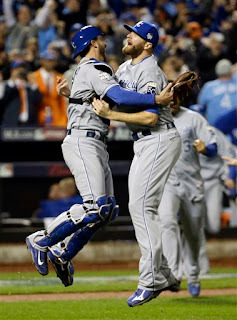 Kansas City had the best record in the American League, and they played like it for three rounds of playoffs. It wasn't a bad series for a five-gamer. Two of the games went multiple extra innings, and the Mets had late leads in three of their four losses. Poor Jeurys Familia wound up charged with three blown saves, although in two of them he inherited the jam and he didn't allow a baserunner in Sunday's blown save. I spent most of the Series listening to either the Mets or Royals radio feeds via the MLB At Bat app. It didn't synch up with the TV broadcast all that well, but I also didn't have to listen to Harold Reynolds. Anyway, there was an ad running frequently on the KC feed that said This is the greatest time to be a Royals fan. Maybe. The George Brett era was pretty darn good. 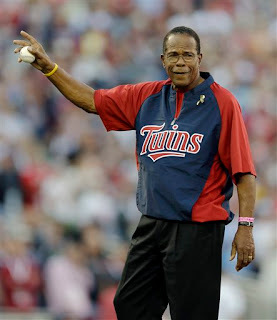 Brett, plus Amos Otis, Hal McRae, Frank White, Dan Quisenberry, Willie Wilson ... They dominated the old AL West for a full decade and went to two World Series, winning one. It wouldn't have taken a lot for them to have gotten to more Series; they just fell short in the playoffs a number of times. These Royals have done something the Brett-era Royals didn't: They've gone to two Series in a row. How much staying power this model has remains to be seen. Alex Gordon, who I believe is their best player even if Ned Yost hits him eighth, will be a free agent this winter, and some other key components will start approaching that status in the next few years. Keeping the band together is not going to be easy. But that's for the future. The players and their fans can celebrate now. And they will. No trick-or-treating for this kid. But I suspect going to the World Series is sufficient treat.